Have you seen SwedelsonGottlieb Senior Partner David Swedelson present his Playing by the Rules seminar yet? Be sure to catch his next offering of this popular program with co-presenter Craig Phillips on July 30, 2014 at 8:00 a.m. in Valencia. 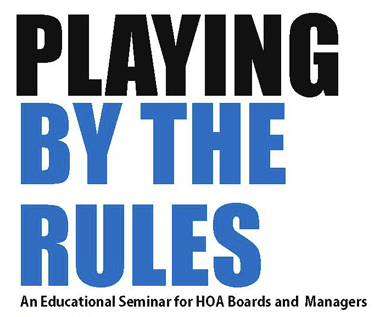 The program is free to HOA board members and managers who preregister. Topics covered include handling rule enforcement issues, the hearing process, the fining procedure and how to collect fines. Follow this link to register for the event.